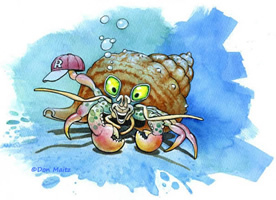 The story of the musical, Russell, the Hermit Crab, focuses on a young hermit crab who, as a result of living in other creatures' shells, doesn't know who or what he really is. Who am I? I can't tell in this lousy second-hand shell. What you think you see isn't really me, who am I? Who am I? His journey to discover his identity begins at home in the bay with his friends Crab, Shrimp and Lobster. Lobster suggests Russell imitate his movements in hopes of turning himself into a lobster, and to see if, in fact, this transformation will really work. Then you can be a brand new you. Just like me in everything you do. Russell tries for weeks, but all are disappointed when Russell's changing red color turns out to be the result of the red seaweed from red tide. Shrimp convinces them all not to give up and to venture into out into the unknown deep sea to seek the wisdom of the great wise Sea Turtle. Friends, we'll be there right beside you, friends to help show you the way. Friends who every night will guide you safely till another day. You don't have to worry, Russell, we'll be there for you! Along the way, they get caught in a lobster trap where Russell discovers that his detested shell might be useful after all. He is the only one of the group that can slither out of his shell and squeeze through the wires of the trap to open the latch and free them all! Russell's momentary elation is dashed when they find the great Sea Turtle who does not offer Russell a definitive answer. There are some things in life you must learn on your own. You cannot be told by a friend. Only then will you see in the end. So live with the question. Don't rush, little one. The answers aren't found in a place you can look. They're not written down on the page of a book. They grow from within with all that you do. Through living your life you will learn about you. Suddenly a boat overhead churns up the water, and Russell finds himself separated from his friends and forced to face his worst nightmare, being lost and alone out in the deep sea. Russell is offered refuge (and a life of crime) by Angel Fish and her thieving husband, Gus Grabber, the octopus, who try to convince Russell that the answer to his identity lies in fact, in his name. It's all in a name, kid, without one you're clueless. A kid with no name is a kid who is who -less. It tells who you are, what you've done, what you'll be. Your name is your claim to your fame...in the sea! After narrowly escaping with his life, and convinced by Gus that a name is truly the clue to who he is, Russell decides to call it quits and live as a Hermit Crab. If a hermit's what I am, then a hermit's what I'll be. I'll live my life with no one else, with no one else but me. Russell's thoughts are interrupted by Seahorse, a fun-loving, larger than life ocean cowboy who sets Russell straight about names not determining who you actually are, and directs Russell back to his home in the Bay, suggesting he might find some answers from the people on the beach. Once home, Russell summons up the courage to do the unthinkable, go up on the beach in search of the answer to his question. Realizing he can use his shell to help him roll up onto the shore, he throws himself into the crashing surf and is tossed up onto the beach where he is found lying unconscious by a little girl, Elizabeth. Quickly she takes off her sweatshirt to offer shade from the hot sun. When Russell realizes he is not the only one who can "take off his clothes," he is ecstatic. "There is actually someone else like me!" Through Elizabeth's song, Russell learns that his outside appearance does not define who he is inside and to embrace his own individuality. I can dress up differently, but that's just what you see. I know I'm unique, that's what I'm meant to be. For deep with in the heart of me, there's a special part of me. That's what I am, that's me! Freed of his burden and reunited with his friends who have found him on the beach, Russell embraces the world with his final song. And an endless sea to see. There's a great big world and seven seas and endless possibilities! There's a great big world just waiting for me! !